S.T.E.P.S. answered the question of the competition “How to Create Vibrant Productive Districts with Craftmen, Makers & Local Production?” overcoming the ordinary INDUSTRial SYSTEM with an innovative DIFFUSED SYSTEM where the PEOPLE, at the micro scale, trigger new productive and reciprocal interchanges and the PRODUCTION process at the macro scale. S.T.E.P.S. comes from the combination between the PRODUCTIVE and the ENVIRONMENTAL SYSTEMS. 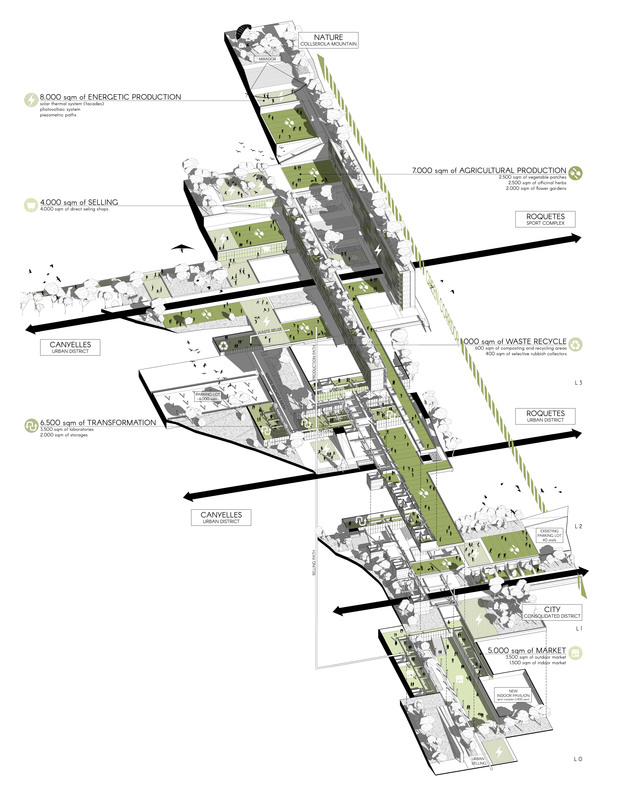 It aims to create a mixed zone, where the residantial, commercial, recrative and productive areas have not boundaries, and let the people free to switch from one activity to another. It is a real SHARING SYSTEM that allows, both to the CITY and the surrounding neighborhood, to freerly use all the products and the activities coming from inside it. All the SPACES, except for the housing units, are public and freerly used. These spaces are designed to enhance the connections among the comMunity. The people and their relationships are THE CENTER of the project, to improve the life quality in the neighborhood. 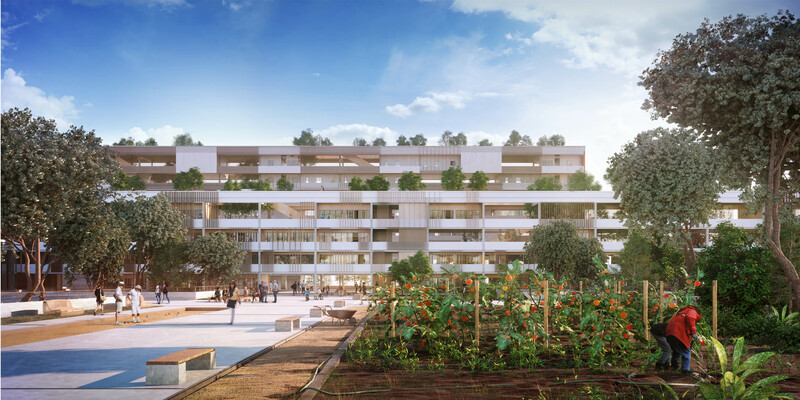 So, for example, the bocce playground is near to the sport areas to guarantee a intergenerationAl exchange, or the vegetable gardens are directly connected with the public squares to enhance the relationship with the workers and the neighborhood inhabitans. S.T.E.P.S. 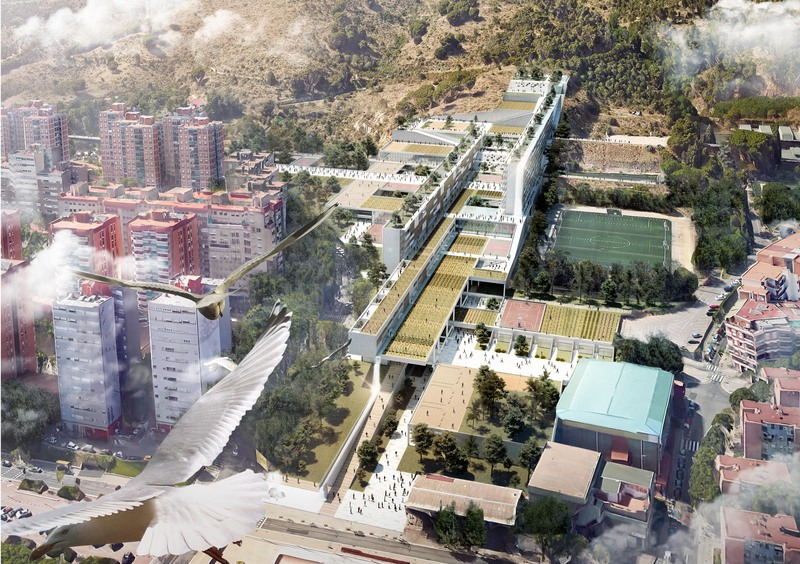 is a new approach for a innovative mixed-city, where the urban life and the productive economy coexist and all the activities are well designed to encourage the community interchages. BUT HOW THE ARCHITECTURE CAN DO THAT? The project starts from an element that contains all the activities (both public and productive), like a productive EARTH CLOD (1). This element is adapted (2) to the natural context (Collserola Mountain) generating a multitudine of terraces at different levels, each combining a mix of functions. The residential BUILDINGS (3) are embedded in the terraces to vertically reconnect the system. The CONNECTIONS (4) with the city, expecially from Canyelles to Roquetes, are ensured thanks to new pathways. S.T.E.P.S (5) is a new genuine and vibrant piece of the city! S.T.E.P.S. rethinks the production process for the agriculture sector. 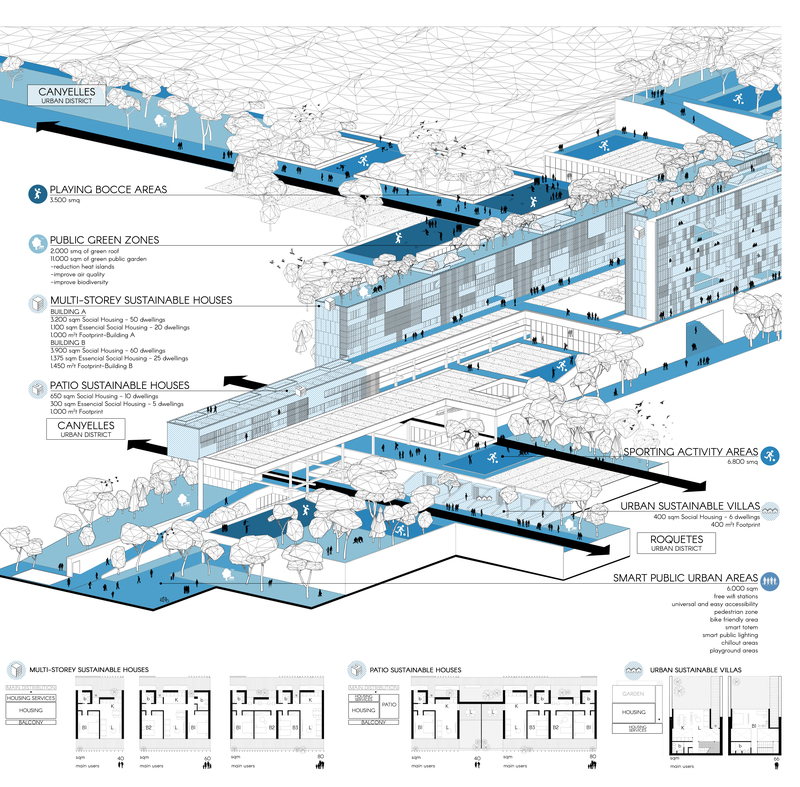 All the ORDINARY PROCESSES are inserted inside the CITY, defining a new way to live and produce together. In the ORDINARY PROCESS, the product crosses throught three different important steps: the CULTIVATION, the TRANSFORMATION and the CONSUPTION. All of these phases are combined into S.T.E.P.S. to enhace the relationship between the PRODUCTION and ENVIROMENTAL SYSTEM, to create a new life style matching the urban and the agricoltural life and to reduce the enviromental pollution impact. The production of food and energy in the community areas, is collected into dedicated storages, suitably transformed in labs and small workspaces and sold throught direct shops or sent to the urban market. The waste materials coming from this process will be reused as fertilizer. The private production is directly consumend among the residents or sold in a small part. S.T.E.P.S. is essentially based on the combination of the energetic and agricultural productive systems, ensuring a new way of living and self-sufficiency. The agricultural surfaces are differently combinated, with vegetable gardens, officinal herbs and flower gardens, that ensure a seasonal food production and biodiversity. The energetic ones, count vertical solar thermal surfaces, photovoltaic totems and piezometric systems, placed in the common areas or on the residential facades, that produce all over the year a continuous furnishing of hot water and electric energy. The great variety of vegetables and esseces planted let to harvest and collect the patches continuously, with a SEASONAL ROTATION that keeps the hortus and gardens fertilized. Essential for the design was to consider a new way of production, based on sustainable processes preserving natural sourroundings and using renewable resources. Barcellona’s climatic conditions analysis highlighted that the greatest energy building consumption, to guarantee the correct indoor comfort, is due to summer cooling unlike winters wich are generally mild and temperate. 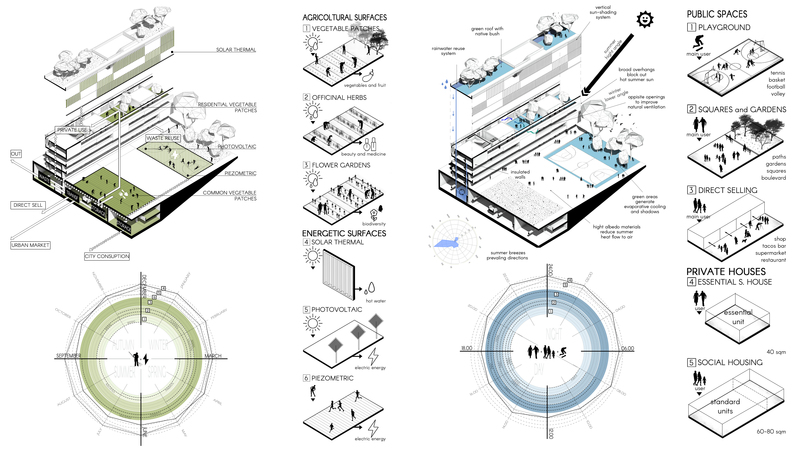 To lower consumptions, CO2 emissions, to improve the indoor and external comfort of the air, project proposal uses passive strategies to minimize installations use. S.T.E.P.S. perfectly combines PUBLIC and PRIVATE SPACES, offering to the city of Barcellona new place where people can freerly stay together and live in. The public spaces count a great variety of areas, as playgrounds, squares and gardens and direct selling zones, everytime used and lived by both the visitors and inhabitants, and promoting an intergenrational sharing of experiences and relationships. The private areas, mostly made of essential and social houses, are made of different typologies of dwellings, designed to welcome any kind of user, enhancing the reciprocal exchange between families and elderly people.